be proud of me, folks. stand up and applaud and cheer and stomp your feet and yell out accolades, which i will proudly accept because this - this! - was no small feat. i worked and toiled on both saturday and sunday, cussing and fretting and crawling under spaces, pulling furniture out and in, moving boxes here to there, filling FIVE large plastic bags of garbage to overflowing (don't ask), and standing in the middle of the room for more times than i care to admit and wailing, "where do i begin?!". it wasn't pretty. i was a mess, and my body at the end of yesterday, as the light begin to dim outdoors, was an aching lump of muscles that had not been used that way for years. but - and i exaggerate not when i tell you this - when i finished as much as i could for this stage (there is one wall left to conquer, and no, you will not be seeing photographs of it, i do have some smidgens left of pride inside of me), when i finished i stood back like a proud little girl, beaming, and blurted right out loud, "oh, i am just tickled pink!". this is not something i tend to say. 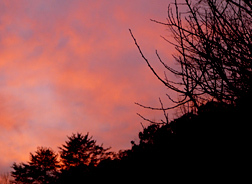 pink is not a color with which i am enamored - but say it i truly did, and then noticed beyond the dark studio doors a glimmer of the sunset skies draping themselves across my living room windows. how wonderful - o! how wonderful. i sat here and imagined showing a photograph of myself standing at the doorway of the studio, all dolled up in a 1950's taffeta dress, hand outstretched, beckoning you into the newly redecorated splendor of my workspace, and had to laugh. here i sit, in pajamas, black framed eyeglasses (as you see in the photo above), hair looking not much different than it did when i first got out of bed. i'm proud, though. the studio does look good. i can see the surface of my table for the first time since i moved here, 2 1/2 years ago. it's white, or a dirty cream, an old church table that i purchased for all of $7.00 a presbyterian rummage sale and then covered with pages torn from an old french/english dictionary. i never see that surface anymore - how lovely to see it now again, ready for action. ready for magic. ready for inspiration. i've walked in that room countless times last night, and again this morning, just to stand and stare. it makes me feel good to see my familiar trimmings and trinkets lovingly arranged, as opposed to thrown in piles haphazardly, fabric with paper, sticks with beads, tangled beyond recognition. 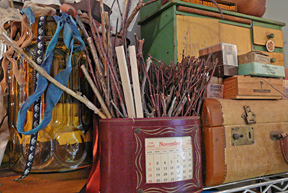 this vintage desktop calendar organizer now brings me enormous pleasure, holding as it does some of the sticks and dowels that i use in my artwork and jewelry. no longer are half of them on the floor, or mixed up in barkcloth and linen. i use a great deal of vintage ribbon in my work, and if you'll go back and look at the shelves to the left of my table in the previous post, you'll see a great writhing pile of minerva-like strands tumbling out and over and down to the floor. at least now, for this time being (shall we time it? ), the ribbons are contained in an old amber glass jar, as well as in a little three drawered chest - that is, until the first time i need the snippet that is assuredly at the bottom of the assortment. you don't want to be here when that happens. it's daylight now, and a sunny day, so it's hard to imagine the wonderful effect of all those tiny lights on the tree branches and the vines draped across the window and (mighty heavy) antique mirror i've hung to add more light on the wall behind my table. but seeing these lights makes me actually long for the first snowflakes of december, and cups of chai and my favorite classical music floating in through the door. my goodness. a minor miracle has occurred, then. i'm actually wanting to be there, in that dark little room, and begin to work my fingers like an elf far up at the north pole, nimbly fashioning magic into ornaments that will bring comfort and cheer to those who carry or wear them. i look around me and see little vignettes of magic - a house here, a gathering of tiny dollies there - and do indeed feel surrounded by stories and comfort and all things sweet and serene. as i should be, in the place where i work and create. what's wonderful to imagine is the stories these little dolls may carry from here to there with them, when they leave their world of tree branches and tiny white lights, and go out into the greater world beyond, sent out by someone who has given them the beginning of a story, and urged them to tell the rest to those who will wear them close to their heart. oohh!! i am so impressed and jealous as HELL. my studio is in our bedroom - as a result, the only neat thing in there is the (usually) made-up bed. 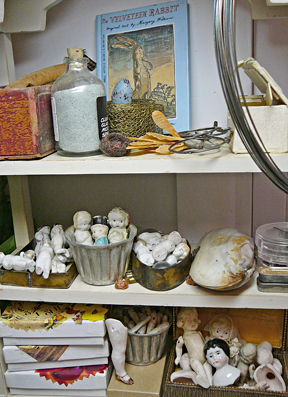 i so love all my tschotchkes on all my shelves - but you could write your name in the dust (don't tell!). This is beyond gorgeous. I am really in awe. that room is magical! i love those lights. Awesome! You should be proud of yourself as it looks beautiful and inviting. I love the twinkly branches and the dolls in the tubs. Oh Nina, it is AMAZING! I can't wait to see the inspiration that flows through this room, into your soul and back out again through your hands and into your beautiful creations. OK, now THAT is some studio cleaning inspirational stuff! It looks Amazing, and it looks like the sapce is So ready fro you to come in and create all winter-long. Lovely. You've somehow managed to create peaceful in that space where magic happens. OOOOOOOHHHHHHHHHH girl , you totally ROCK!!!!! It must have been those purple tights. Everything looks real nice and I love those elfin lights draped over the twigs. I have matching lights over my mantle. Now, I've got to get my room to match yours, in neatness. Ughgh! Yes sir, I mean ma'am, you truly pulled it off. Now...if I beg really nicely , will you come here and do mine?? HOORAH, HOORAH, HOORAH!!!! Way to go Nina!!! As soon as I saw the first pic I thought it was Christmas with those beautiful lights! Also, you have so perfectly described just how I feel when I walk into my studio...the comfort and serenity is so unbelievably precious and i always hope that some of what I feel is present in the things I make in that room. Wow; what a journey and what a great tale about getting there. Really, I hung on to every word! You are so cool, Nina; your digs look fantastic! What a magical wonderland you've created Nina, I could see your jewellery hanging from those twinkling branches, the light bouncing off your wonderful silver and gems. OMG! Frame these pictures and have one tattooed! Way to go, lady. I know this can be a long time coming and a long time to complete. Proud, very. Plus, your studio looks wonderful. LOVE those lights. I look at that studio and it fits YOU. Now get busy and make stuff to mess it up again! Bravo Nina - what a satisfying way to spend the weekend. Now, to work with you! O Nina it is absolutely beuatiful, I want to come and play in your amgical place. It is so inviting..
WOW it looks to pretty to make a mess now !!! I bet you feel better now .Hey can I take your rubbish out to the bin/Jens house!!! Amazing - you've done it and done it well! I love that feeling you spoke of when you've worked hard and love the results. Wow, it looks like a really magic place. I am totally stealing your idea and putting up lights, too. May your working hours be filled with dreams. Its marvelous!!! You should be proud. I love the idea of the mirror -- an additional point of light. You're going to walk in there and just want to get busy and create, create, create - however I'll bet a lot of us would have loved to have gone through your 'bags of junk' before you threw them out! 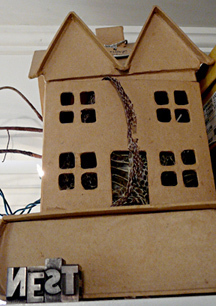 Nina- I just love how enchanting your dream/work/create/collect room has become this weekend. I do feel your aches. I hope you enjoy that wonderful space for days and days. I can just see you tinkering away in that little twinkling wonderland, like an elf on Christmas Eve! It is beautiful Nina, I am sooo envious. I just got fed up with my mess and only cleaned the desktop, now, after seeing your huge effort, I am terribly ashamed of myself... Maybe next weekend...?? How very beautiful dear Nina--radiant just like you. Can't wait to see the enchanted treasures produced 'neath your lovely branches. What a clever girl you are Nina. 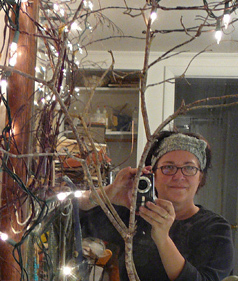 The branches and faery lights are amazing! I keep faery lights on my windows all year long to brighten up the nights too. My neighbors think I'm nuts but I don't care a bit. And I'm absolutely in love with the crow I see above the mirror. I use their image in my work all the time and I attract them into my backyard so I can photograph them. I hope you spend many cozy days in your studio drinking tea and creating those treasures that you are so good at creating. okay, i took the first step and acknowledged my very own messy studio after your earlier post, now you've inspired me to tidy it up and so i can ENJOY the space and all my own lovelies again. thank you. Job well done indeed! Your studio now looks as magical as the lovely jewelery you create there. As you spent the weekend carving order out of chaos, I attended a 3 day workshop with Lynne Perrella. Arrived home this afternoon with artwork and shopping - looks like I may need to do a studio overhaul to find room for all! Would love to hear the delightful stories your little porcelin babies will tell when they emerge transformed by your loving touch to begin a new life yet once more. Oh my! 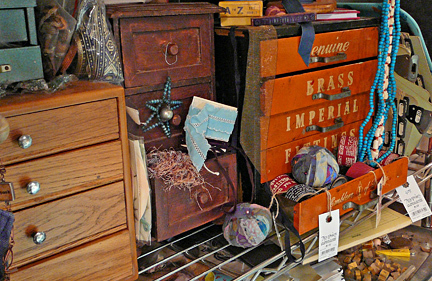 I tidied up a bit in my studio this weekend, but now I see I need to set my sights a bit (make that a mile) higher! I want some pixie lights and branches of my very own!!! Thanks for the gasp of delight. Very inspiring! I am loving the lights on the vines. I think you may have started another trend! I did some clearing out myself this weekend. It just feels so good when everything is in it's place! Congrats on a great feat! Believe me, I know what a challenge it can be. oh, nina, i am so proud of you! i know the feeling of standing back and just absorbing the room, knowing that it is beckoning to you, waiting for you to create. i have been wanting to add those little lights to my room, was going to wait until i could hit the after christmas sales, but your studio has inspired me to not put it off, and to just do it, just because it will make me happy. thanks for sharing your beautiful studio with me! 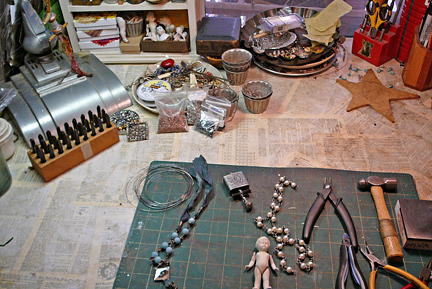 I truly know how hard it is to keep an tidy studio, it is impossible for me *grinning*! I always make an promise, that if i will keep the studio tidy after the cleaning, but never can keep it. I am thrilled to see these photos. The faerylights bring always more magic in a any place. it looks wonderful and inviting. I too end up with a small square to work on and then at some point the need for order kicks in. During the process I always find objects or ideas I had forgotten I have. I hope you did too. This post left me smiling for your childlike glee and Christmas' morning attitude. And these wonderful wonderful windows into your world just add more to the magic of YOU! Tidy or untidy, it's all fabulous! bravo! i love your new studio. and those lights...what a great idea. my studio is the best room (to me) in the house. you deserve the best place in your house to create. now you'll do your best work ever. What a beautiful transformation - enjoy! utterly, completely, captivating and transformative-- I do believe a person could walk into that space and literally be transported to other realms simply from the magic energy you have created. And, inspiring. As I say, just gazing on these pictures feeds the soul-- I cannot imagine how dreamy it would be to acutally stand in that space. I'm just apple green with envy, my sin ripening into lust for so much space. I like the Christmas lights - they lend a festive air to the space, as if your little room is an adjunct to Santa's workshop. (Ah, the limitations of New York City apartment living.) Congratulations. Ooooo, what a beautiful and magical place, Nina! You must be feeling so euphoric and newly inspired with your amazing accomplishment. Enjoy, enjoy, enjoy! Beyond words lovely! I am so inspired to clean my studio in one fell swoop instead of bit by bit. Note to self...need "MAGIC" purple tights. Such Light amazing..........ya know i work with those lights year round and have grown to loath them.not no more you have made me "see the light". when i get home i am gonna do that while i wait for the tract lights that have been sittin in the box since feb,o6. immediate i love immediate!!!! why... mz. nina... DON'T you look RADIANT... amidst those twinkling lights and the beautiful wintry blue night sky cascading through those windows. one might mistake you for a fairie or woodland sprite. Whoa! Would'ya mind sharing the magic wand?? I need to do a bit of mucking out as well!! Come to think of it.After all that cleaning-up, it might be kinda fun to do a 'dumpster dive' at your house!! ...loving the little lights! They are so happy-making! Yessssssssssss ! LOL Your studio looks great , you can indeed be proud of yourself ! I love what you did with the lights ! I spent the last two days sorting my beads and like you now that is tidy I want to start making things ( more mess ahead! lol). How enchanting :) you accomplished a great feat! I guess your purple tights really did do the trick! Looks awesome Niina! I love the branches and lights - being outdoors without the cold! Oh Nina! You got somemuch done in just two days? I can't believe it! It looks wonderful and just like a place I'd love to meandor through and explore for hours! It's truly a haven. It looks fabulous! I need to do the same thing in my mess of a studio. You've inspired me!!! 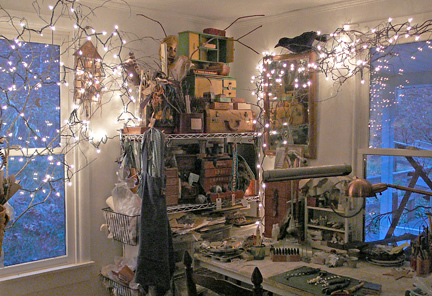 Wow, i want to hang fairy lights from branches in my studio now. First I have to kick the hubby and his computer paraphenalia out, so I can claim extra space for more stuff. I don't know, how do I choose? His lovely company or more pretties? I think the pretties may just win out. It all looks adorable sis, big yummy. What a gorgeous retreat! Thanks for the inspiration! I am going to follow your lead and organize all my scattered art and sewing supplies this weekend while my hubby is away in Michigan for a football game. I don't have a studio room, but when I'm finished, a small corner of the basement will be mine, all mine. Unfortunately, I will then have no more excuses for failing to create or following through with my ideas - or finishing Christmas gifts that I started ten year ago! oh how wonderful it all looks. i love taking a peek into your creative space. Dear Nina, well done - it is pure magic! You have created a fairyland all of your own. It is so pretty - you must be beyond thrilled with your efforts. how did you put down those dictionary pages..awesome idea. I love your space, and your work. 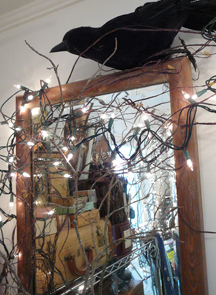 I love the tree branches with white lights, and crow. Nina, what an inspiration! I'm in the process of deciding how to rearrange my studio. 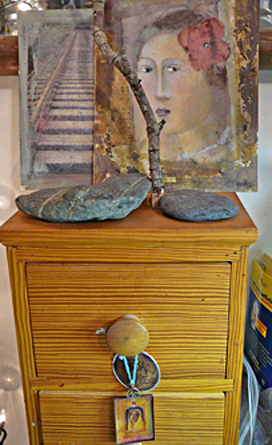 I've started cleaning up some areas here and there; it is so cool to find a countertop under all the stuff. Ah, space! I love the branches and white lights. That is a great idea for bringing more light into the room. Congratulations! Amazing studio with a capital A!! What an abundance of incredible goodies. I love the string of art pieces hanging over your table. Such inspiration!!! hey sweetie...looks faaa-buuuu-louuuus darlin'! i've missed you...i SO haven't been around...not physically, nor any other way. let's catch up. in the studio basement...and really NEED on of those crows or ravens!! !